Mention Costa Rica, and images of natural beauty, rain forests and a popular retirement destination for Americans comes to mind. Like most small nations, coinage of Costa Rica has a very low profile in the numismatic community. That means an interesting history of coinage is largely overlooked, and the collector who wants to take the less-traveled road and an overlooked challenge will find it here. Originally part of the Central American Republic (CAR) of 1823 to 1839, Costa Rica was in a sparsely populated union that included modern-day Guatemala, Honduras, Nicaragua and El Salvador. 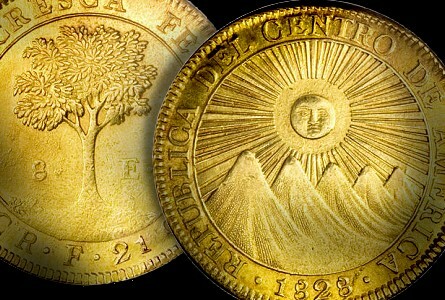 A radiant sun overlooking three mountains was the common theme on much of the CAR’s coinage. The 1/4 real contained .0247 ounce of silver, which means 40 of these dinky pieces contains less than an ounce of the metal. Struck sporadically from 1824 to 1851, this and other coins of the Central American Republic were minted after the demise of the nation. The 1/2 real (1831 to 1849) shrunk from .0491 to .0407 ounce as time passed. Neither the 1/4 or 1/2 real were struck in large numbers, and the real and 2 reales are scarcer still. Yearly mintages are unknown, and certain issues were hold. As with other Latin American and Spanish coinage, the crown-sized 8 reales were produced in greater quantities than fractional pieces. The Central American Republic versions were struck from 1824 to 1847, and the series is filled with overdates and other varieties. Collectors who like variety in designs might be disappointed with the early CAR/ coinage of Costa Rica, as the common theme of sun and mountains on the obverse (larger coins featured five mountains instead of three) and a lone tree on the reverse with the denomination stamped in block lettering is used on all the silver and gold pieces. The gold 1/2 escudo is comparable in size to the U.S. gold $1 of 1849 to 1889. It debuted in 1828 and wasn’t struck again until 1843. That was followed by annual runs from 1846 to 1849. With a listed mintage of 593, the 1843 is the key to the series. Gold escudos in an .875 fine alloy with .0949 ounce of the yellow metal debuted in 1824. They were struck sporadically and in modest numbers until 1850. That final date is rare with an unknown mintage, and an AU specimen sold for $12,000 in an October 2008 auction. Just four different dates (1828, 1835, 1843 and 1850) were struck in the 2 escudo series. With mintages of 2,750 to 7,432, the series is both challenging and short enough to complete. Likewise, the 8 escudos (struck in five different years beginning in 1824) doesn’t include a long list of dates. What makes early coinage of Costa Rica unusual is the large number of counterstamped pieces. Everything from the small silver 1/2 real to gold 2 and 4 escudos was counterstamped with a with a six-pointed star in 1841 and 1842. Many of these pieces weren’t newly struck coins. Among the unusual items are counterstamped and holed Mexican 1 real silver, Peruvian 2 reales, Bolivian 4 reales and Peruvian and Mexican 8 reales. Such a wide range of counterstamps points to the likelihood of a coin shortage. A COSTA RICA counterstamp with a woman’s head was used in 1845. It was placed on old Spanish and Cuban 2 and 4 reales, a Peruvian 2 reales cob, Guatemalan 4 reales cobs, Bust and Seated Liberty half dollars, various South American 8 reales cobs and klippe-style Mexican 8 reales of 1733 and 1734. When paper money is overprinted, it generally means turning a note into a much larger denomination due to hyperinflation. 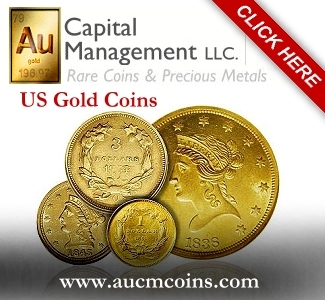 In this instance, it merely added an interesting feature to honest (precious metals) money. Even though Costa Rica gained independence in 1839, countermarks on old Central American Republic coin designs were used until 1857. A small mark with a lion in the center was used during this nine-year run. In addition to silver 1/2 real, real and 2 reales, gold 1/2 escudo and escudo pieces were also stamped. Some British 6 pences and shillings also carry the lion counterstamp. This practice ended when Costa Rica converted to a peso- and centavo-based monetary system in 1865. Numismatists who want a real challenge and something that few others have pursued may find the early decades of Costa Rica to be an ideal specialty. Beautiful. I have overlooked the series. I must explore further.